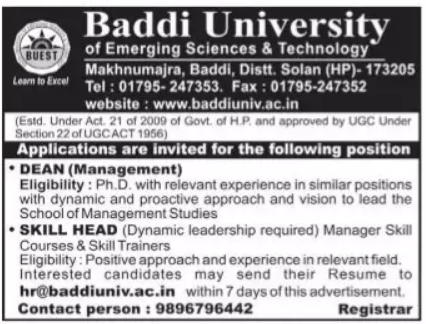 Baddi University, Solan has advertised in the TRIBUNE newspaper for recruitment of Dean / Skill Head jobs vacancies. Interested and eligible job aspirants are requested to apply within 07 days from 19th September 2018. Check out further more details below. About University : The Society named Center for Advanced Studies in Engineering (CASE) was established on 2nd May, 2000 with a deep commitment to promote and propagate quality technical education. The commitment was translated into reality with the establishment of School of Engineering & Emerging Technologies (SEET) at Baddi in the year 2002. Skill Head (Dynamic leadership required), Manager Skill Courses & Skill Trainers: Positive approach and experience in relevant field.